3D Printing encompasses various different technologies like the deposition modelling, Stereolithography, sintering, binder jetting, etc. but the basic process still remains the same. 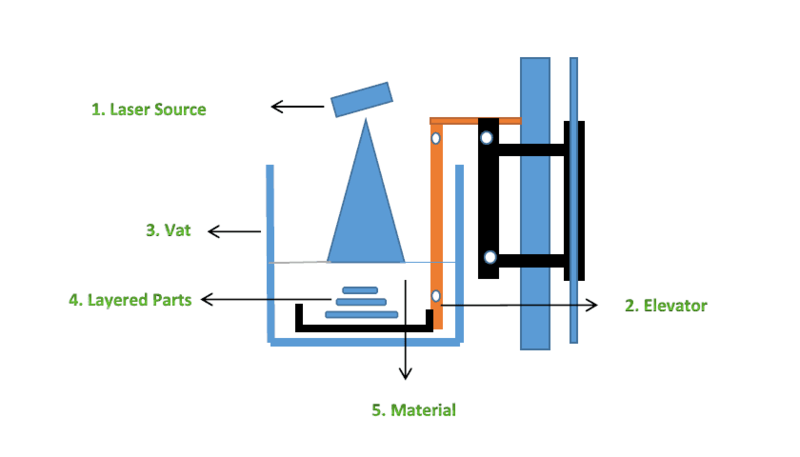 Below is the universal step by step 3D printing process followed irrespective of the technology used. The first basic requirement for a 3D printer is a CAD Model. It is the 3D design for the product you want to 3D print. This model can be developed from various softwares (Catia, Fusion360, Solidworks, Creo, etc.) but the final output has to be in the two most popular formats namely, STL & OBJ. The designed model is now to be loaded into slicing software. The slicing software or Slicer, literally slices the 3D model into multiple layers depending on the specifications you provide. These slices (also called as layers) are then deposited one above the other during the actual printing process. The slicer converts the design into co-ordinates which the printer understands and the material is deposited as per the co-ordinates. The output of this slicer is in the form of a text file with a file extension being ‘.gcode’. The part can be printed through various 3D printing technologies and depending on the final application of the part, the appropriate technology & material is chosen and machine is set up. FDM printers use filaments like PLA, ABS, PC, PET-G, etc. while SLA & DLP printers use resins with usage-based properties (tough, flexible, dental etc.) & SLS uses powdered material (mostly Nylon). The next step is to simply print the model. The gcode file is loaded into the printer and the printing starts. The printer will print the object as per the print settings adjusted in the slicer. These settings can be modified for every single print. The printing time depends on different factors and can vary from minutes to hours to even days. 5. Material: The material (called resin in case of SLA and DLP printers) is the substance which is used to create an object. There may be different forms of resins used such as tough resin, dental resin, flexible resin, etc. Other printers like FDM & SLS use different materials. Today, a lot of different materials are used in 3D printing. Some of the materials used in 3D printing include gold, silver, ceramics, biomaterials and food. Once the printer stops, the print has to be removed from the bed. This process varies as per the type of technology used. In a standard FDM printer it can be easily removed with a scrapper (it is advisable to wear gloves during this step). 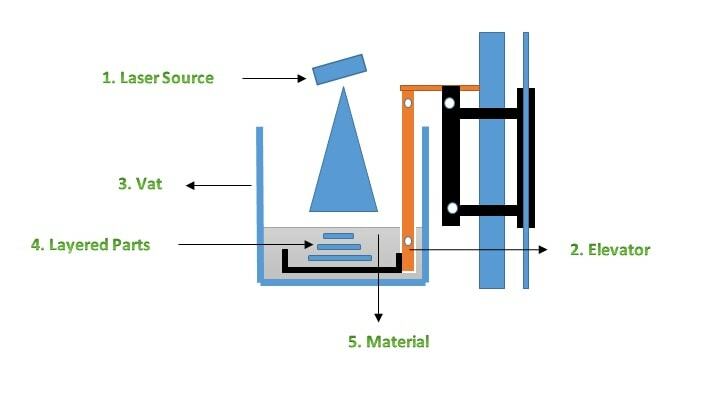 This is the final step in the 3D printing process. Even after the removal of the print the part has to undergo some amount of post-processing. The amount depends on the complexity of the model and printing technology used. The most common post processing techniques include removal of support structures, cleaning off the excess resin material on the surface of the part, brushing off the excess powder in case of sintering technologies, extra smoothening with the help of sand paper polishing or sand blasting, etc.